Friends of SM&AG work to help Swindon Museum and Art Gallery in conserving and adding to the collection. The first sell out talk of the year was a real eye opening excursion into the world of linocuts by Gordon Samuel, who has appreciated, collected and bought and sold them for years, firstly at the Redfern Gallery, and latterly at the Osborne Samuel Gallery. When the Redfern Gallery first opened in 1923, linocuts by Claude Flight were being sold for 5 guineas, now they can fetch up to £150,00. Apparently in 1927 when Claude Flight wrote a book about linocuts, he said 'A linocut colour print should not look like an oil or watercolour painting, it's a print from a soft linoleum block and so it should not be taken as a woodcut, a wood engraving, or an etching, it should take its individual place on a wall and be recognised as a linocut'. The Grosvenor School of Modern Art was a private British art school. It was founded in 1925 by the Scottish wood engraver Iain Macnab in his house at 33 Warwick Square in Pimlico, London. 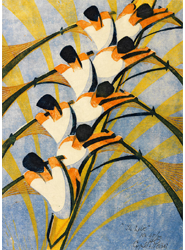 From 1925 to 1930 Claude Flight ran it with him, and also taught linocutting there; among his students were Sybil Andrews, Cyril Power and Lill Tschudi. Thanks to Wikipedia for the concise summary. If you click on the link, you'll find lots of images of linocuts. Gordon explained how linocuts are made, with slides to show us the stages to achieve 3 or 4 colours. The linocuts Gordon showed us on the screen were fantastic, for their depiction of everyday London scenes, movement in sport and leisure and workers in the landscape. It's hard to pick out favourites, The Escalator' was also a particularly lovely linocut, also by Cyril Power. After the talk, people stayed around for a while chatting, and having more drinks. A great start to our 2018 season of talks. Thank you to Gordon Samuel for providing such a great insight into the history of linocuts and showing us such memorable images. Last Friday, Sophie Cummings gave a fascinating talk on the Euston Road School exhibition in the small gallery to a large crowd. The Euston Road School last from 1937-1939, and was characterised by acutely observed paintings often of naturalistic subjects with a bit of a dull appearance, as though they need cleaning. I've included three photos of the people who came to listen, it was a very popular talk. Above Curator Sophie Cummings just visible on the right hand side of the photo. Below, the gorgeous painting by David Tindle RA, 'Teasel Plant, 21, Warwick Crescent, W2 painted in 1955, influenced by the Euston Road School. there were some paintings on loan for the exhibition including some from Basil Rocke, lent by his family. This one below is entitled 'Dried Flowers and Oil Lamp' is very closely observed. The painting above is by John Dodgson, 'Landscape, Provence', there's also a preparatory drawing. Although there's a bit of reflection, you might be able to see the artist in the foreground with a couple in the background. It's by William Roberts, 'Nature Morte', watercolour and pencil on paper. Roberts was an associate of the Euston Road School. This drawing is also by William Roberts, it's study for 'Bank Holiday in the Park. Sophie drew our attention to the two dogs in the bottom right of the picture, greeting each other with lots of sniffing as dogs do. The piece above is by Clive Hicks-Jenkins, 'Burden' and is one of the 50 Gift of 2017, in honour of Meryl Ainslie. It's very good to have this wall signage, really a hangover from the previous Janet Boulton exhibition. The Euston Road School is a term applied to a group of English painters, active either as staff or students at the School of Drawing and Painting in London between 1937 and 1939. The School opened in October 1937 at premises in Fitzroy Street before moving to 314/316 Euston Road in February 1938. The School was founded by William Coldstream, Victor Pasmore and Claude Rogers. Graham Bell was a substantial theoretical influence on these teachers and Rodrigo Moynihan was also closely associated with the School.Students at the school included Lawrence Gowing, Tom Carr, Peter Lanyon, and Thelma Hulbert. The writer Adrian Stokes and the poet Stephen Spender attended drawing classes. Vanessa Bell and Duncan Grant were among visiting teachers to the School. The emphasis was on acute representational painting based on observation. The School emphasised naturalism and realism, in contrast to the various schools of avant-garde art then prevalent. Many of the members were on the political left, and naturalism was seen as an attempt to make art more relevant and understandable to non-specialists and members of the public. To this end, Bell and Coldstream spent three weeks in working-class lodgings in Bolton, Lancashire in April 1938 painting cityscapes showing local factories. The resulting paintings were not highly regarded locally in Bolton. 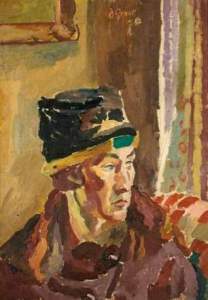 Later in 1938, the Euston Road artists contributed to the Fifteen paintings of London exhibition held at the Storran Gallery. In an attempt to engage the wider public, private invitations were sent to everyone named Brown, in the Post Office telephone directory. The School closed at the start of the Second World War, as its members joined the Armed Forces, worked as war artists or, in the case of Pasmore, were imprisoned for being a conscientious objector. A small exhibition, Members of the Euston Road group was held at the Ashmolean Museum in 1942. In 1945 Pasmore, Coldstream, Rogers and Gowing were all teaching at the Camberwell School of Art and two further exhibitions followed, The Euston Road School and others at the Wakefield Art Gallery in 1948 and a group retrospective organised by the Arts Council which toured Britain throughout 1948 and 1949. By the end of 1949 the artists had embarked on separate projects, with Coldstream leaving Camberwell for the Slade School of Art. We had a very pleasant evening at Magnum Wine in Wood Street on Thursday, for our first event of the year, a charity fundraiser. There was a great mix of Friends of Swindon Museum and Art Gallery, and people who had bought tickets from Magnum and didn't know very much about the current museum, or the plans for the new one, but were keen to know more. Brian Saunders, owner of the shop, introduced us to a selection of hand picked wines and led us gently through the tasting, encouraging a swirling of a glass here, a sniffing there, until we were able to drink more intelligently than before, possibly. We started the evening with some fizz, not prosecco because it tends to be mass produced, the British apparently now they have a taste for it, drink 80% of the prosecco produced. This was followed by 3 white wines, my favourite being the Te Mata Cape Crest Sauvignon Blanc 2013, Hawkes Bay NZ. We had some delicious Cornish Brie after the last white wine and before the first red wine, then we had double Gloucester before my favourite red, the Casas Del Bosque Reserve Carmenere 2015 Rapel Valley Chile, we then had some Ardennes Pate before the last red wine, and some Taw Valley Cheddar before moving onto the port. The port was De Bortoli Old Boys 21 yr old Tawny, absolutely gorgeous stuff, and we finished up with home made carrot cake. It was lovely to see our logo on the wine tasting sheet as we walked in, such a thoughtfully prepared evening. I bought the wines I've mentioned. I can give anyone who wants to know what the others were, the full list. And Brian behind the counter giving lots of background information on the wines. I think this photo below was after the event had finished and people wanted to buy some of the wines tasted. Brian was assisted in the pouring of wine and handing out of cheese, pate and cake by his brother, Sarah and Hannah Dosanjh. In this lovely painting below, you can see Sarah in the middle of the picture behind the counter, and Brian on the right. It was an absolutely fabulous evening, Brian is a fantastic entertainer and raconteur and knows his wines. Thank you also to those who came along, bought raffle tickets, donated raffle tickets and generally made it such a wonderful fundraising event. We raised £693 which goes towards restoring paintings, buying artworks, sponsoring exhibitions, refurbishing the archaeology gallery and improving our communications.